Pepsi put up a bronze statue of its founder to the World of Coca-Cola in Atlanta. Most of the talk around big sporting events like the Super Bowl tends to strike the hostile tone of wanting to “beat” or “crush” the opponent. But sporting events are just as much about coming together and celebrating the competition. There’s a reason even enemy nations will compete in the Olympics or that the word “sportsmanship” means to treat others with dignity. Apparently, for Super Bowl LIII, that spirit extends to the Cola Wars as well. This year’s big game is being held at Mercedes-Benz Stadium in Atlanta, Georgia — where you’ll find the headquarters of a little soda brand known as Coca-Cola. Of course, the Super Bowl is one of the biggest advertising events of the year, and having it in your hometown is a bit of a coup. But that didn’t stop Pepsi, an official sponsor of the Super Bowl and its halftime show, from finding a way to edge in on the excitement with a powerful gesture. 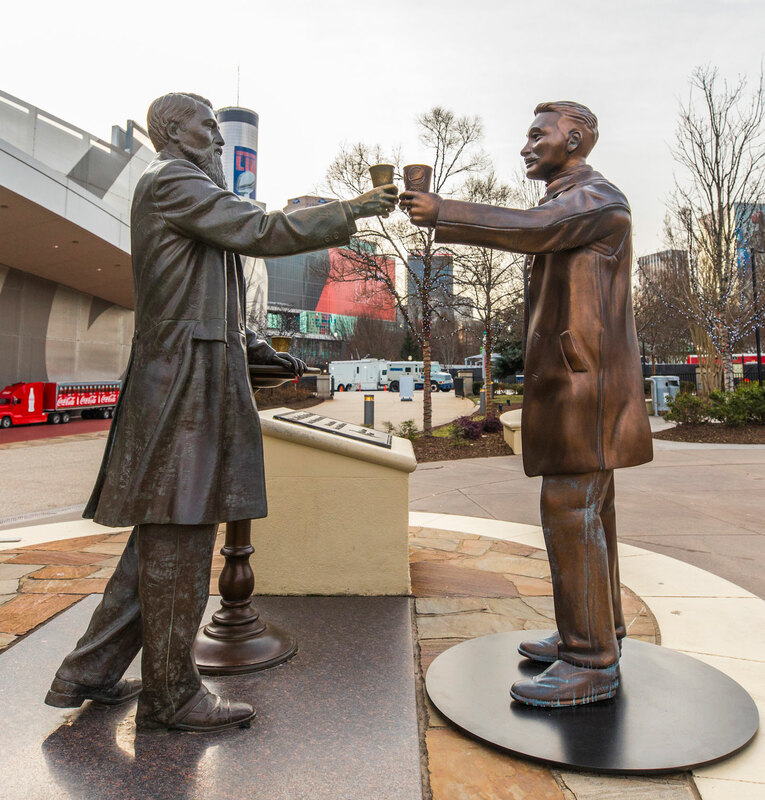 Atlanta is also home to the World of Coca-Cola museum, outside of which visitors will see a life-size, bronze statue of Coca-Cola founder John Pemberton hoisting a cup of his famous soda (you know, the one he originally had cocaine in!). Pepsi’s plan: The rival soda brand created its own life-size bronze statue of its founder Caleb Bradham hoisting a cup of Pepsi, and briefly placed the statues next to each other for a photo op where it looked like two men were toasting each other. Hey thanks for being such gracious hosts for this week. We agree so we’d like to get our founders together for a celebratory cheers to declare a temporary for the day. See you at soon! The that Coca-Cola had no advance notice of the stunt, but the brand played nice on Twitter regardless. “#TogetherIsBeautiful always. Welcome to ATL!” . In appreciation of the city of Atlanta, we want to use today’s to do some good. Pepsi is also attempting to use its #ColaTruce concept to benefit Atlanta in general. “In appreciation of the city of Atlanta, we want to use today’s #ColaTruce to do some good,” the brand . “For every RT or post that uses the hashtags #ColaTruce and #Share2Donate, we’ll donate a meal to those in need in Atlanta through a partnership with @UnitedWayATL.” A spokesperson for Pepsi said the company plans to donate 130,000 meals as part of the campaign.